I paid to attend a yoga class on Sunday for the first time in a long time. I have never been good at Yoga because I have a tough time quieting my mind and focusing on my breathing. It was a bitterly cold Sunday so I showed up because it was something to do and I needed a chuckle. I find the teacher genuinely funny not to mention extremely insightful about your body. She knows the human body and helps you get stuff out of it that you weren’t aware were possible. Sunday’s class revolved around the foot with lots of foot stretching. Did you know your feet keep you rooted to this earth? Feet also have 52 of the 206 bones in your body. Which translates to shoes are not a good thing for your body. If shoes aren’t good for you just imagine how much damage a metal spiked baseball cleat does to the body? I read that Yoenis Cespedes has been doing yoga this off-season to combat his leg injuries from the past two seasons. Cespedes a 32-year-old outfield for the New York Mets changed his off-season routine in hopes of keeping himself healthier this season. He switched from lots of heavy lifting to yoga in order to become more flexible and possibly injury free. Those of you getting older know that flexibility is something that you have to keep working on as you age. When I think of yoga and baseball Barry Zito comes to mind. 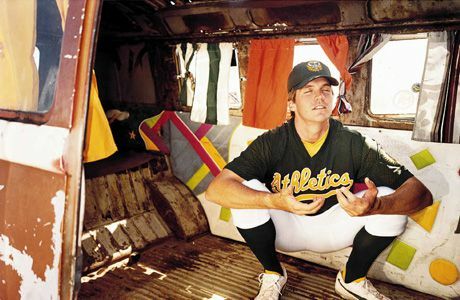 Zito was often seen in uniform practicing poses in the outfield. Most expected it from Zito as his persona was that of a guitar playing California surfer with a Zen lounge in his apartment. Zito was always a little bit new age in his training tendencies traveling with pink satin pillowcases and stuffed animals. Yoga is defined as a Hindu spiritual and ascetic discipline, a part of which, including breath control, simple meditation, and the adoption of specific bodily postures, is widely practiced for health and relaxation. It seems natural that baseball players could use it in their training regimen just to relax and to work on breathe control. The New York Yankees have turned to Gwen Lawrence who has worked with players like AROD. On her website is a testimonial from Yankees GM Brian Cashman. Last season the Mariners teamed up with Pro Positive Yoga to offer classes to their players at Spring Training and throughout the season. Pro Positive Yoga is the creator of NamaStadium and hosts Yoga in the outfield at several Major League Parks during the season. They are releasing 2018 dates for yoga days with the Pirates, Nationals, White Sox, and Mariners (http://propositiveyoga.com/yoga-day/). Why not warrior pose on the outfield grass, it sounds like the perfect setting to me? Ballpark Fare – Do you Dilly Dog It?